In February of last year, a senior girl from my high school was killed in a car accident on her way to school. I found out in second period, just halfway through the school day. With his voice shaking, my teacher told my freshman class what had happened and we grew silent. Few of us knew her, but those who did spent the remaining half of the day in tears. The rest of us were in shock, shocked that someone so young and so similar to us could be ripped away from the world at such a young age. That day, the entire school had a rude awakening to the fact that awful things can happen to anyone. I vividly remember walking through the hallways in complete and utter silence over the rest of that day. There was only one thought remotely important enough to talk about, but it was far too painful to speak of. During class, we were expected to keep working, act like nothing was wrong and keep going, while, in reality, everything about that terrible, terrible day was just awful. Grief counselors came to the school, but how was I supposed to explain my grief for a person whose name I had never even heard before that day? All I could do was hold myself together until I got home, where I just cried. In the weeks that followed, I would hear countless stories of all of the lives she had impacted. She was known as a great person, always having a smile on her face and laughing. She was thoughtful and compassionate towards all of the kids in her classes, one of whom was my own older sister. She was an honors student, fluent in American Sign Language, and interned for the school’s ASL teacher. She was planning to go to college with her best friend and pursue a degree in deaf studies. She was one of the best people that her friends knew, and the fact that such an incredible young woman could be taken so quickly was impossible for any of them to fathom. On the day of her funeral, every senior, most of the teachers, and many other students were absent from school. I would later find out that more than 1,800 people went to her funeral, almost half of my town. People who didn’t even know her went, just to support her family and honor the girl with the gentle soul and glowing smile. At the time, I didn’t know what a massive impact this girl’s passing would have on my relationship with God. I first noticed this a month later at my first YES retreat (a huge youth retreat that my youth group attends every year). Having three older sisters and countless friends who had all had positive experiences there, I had high expectations. During the weekend, those expectations were met, sort of. The retreat itself was incredible. It was the first time in my life that I had seen such a massive group of people so passionate about their love for God, yet I felt detached and different from everyone else. Alone. All of these people seemed like they could “let go” and open up their hearts so easily, while I, even in the simplest times of prayer, could barely feel that God was there with me. At the time, I didn’t understand why this was happening; never before had I had this much difficulty connecting or even feeling His presence around me in such a spiritual setting, or any setting for that matter. After the retreat I was confused, but did not act on it. I didn’t talk to any of my friends, family, or youth leaders about my situation; I just held it all in. That summer, through my church, I attended a camp in Richmond, Virginia. Each day for a week, I would go to church, do community service somewhere in Richmond, and listen to talks, worship, and do activities led by the leaders of the camp. On Wednesday night of the week, I was led through an exercise called Four Corners. Outside of the church where the camp was held, there were four areas marked as healing, peace, faith, and reconciliation. Somewhere along the first three days, I had realized the correlation between the girl’s passing and my difficulty with my relationship with God, so I talked to someone at the faith station. After telling him my story, we were both sobbing. Through the tears, he spoke of how 30 years earlier, his 2 year old daughter had died of an illness. He told me of how much my story and emotions reminded him of his own experience with death. I was confused and even angry with God, and yet this man knew exactly what I was feeling. This man that I had never even met before that night helped me to understand that this girl’s death was not God’s will; God did not want this to happen. Throughout this hectic and difficult year of my life, I have been able to regain some of my trust in God. My relationship isn’t nearly as strong as I would like it to be, but I don’t believe that any relationship with God is perfect. My greatest advice to those in similar situations is to talk about it. Seriously, do NOT do what I did in the beginning. Talk out your emotions to anyone, friend, family, whoever you can. I cannot put into words how important it is for someone to just let out their feelings. While I was a counselor at a summer camp, I was able to talk about my experience in front of 45 young girls and adults, and though that is the last thing that I would normally do, opening myself up in that vulnerable situation was exactly the right thing for me. At the camp, I made one of the greatest group of friends that I have ever had. Talking to these incredible young women is the reason why I do not have anxiety attacks every other day, the reason why there is so much joy in my life, and the reason why I want to grow so much closer to God. I do not know where I would be without these amazing young women. Awful things will happen in life, there is no denying that. This girl didn’t deserve to die so young, and no one in my town deserved to go through the pain of losing someone they loved. You may lose faith in God, you may even struggle to believe that He exists at times, but you can always go back to Him, and he will always be there waiting with open arms. 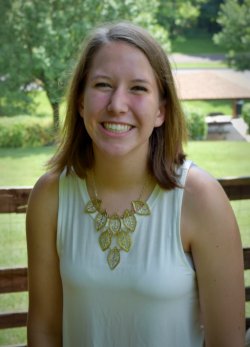 Rachel Heuver is a junior in high school from Frederick, Maryland. She enjoys reading, hiking, quotes, listening to music, eating chocolate, playing field hockey, and hanging out with her dog and cat. Rachel hopes to become closer with God and to share His love with every person she meets.